There’s one thing that Toronto does well, big or small: their beer festivals! 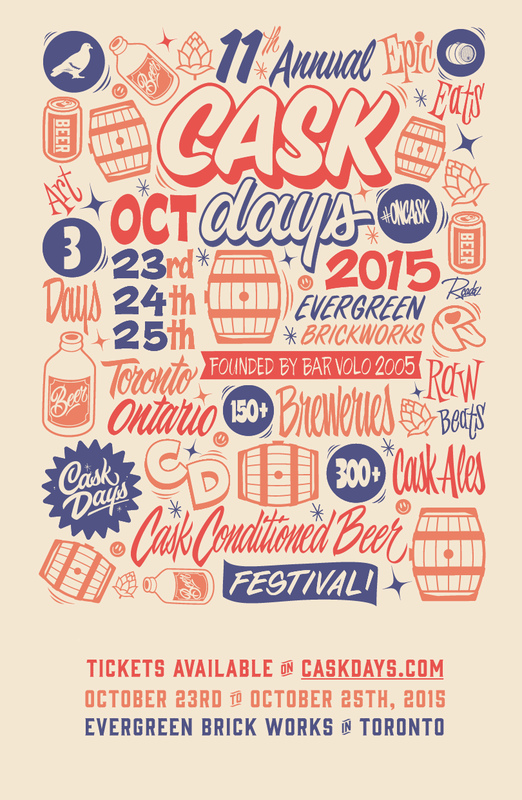 Cask Days 2015 has been a blossoming contributor to this trend and you won’t want to miss out this month’s arrival at Evergreen Brick Works. Over 300 beers and ciders will be served on cask with an expected 8000 attendees, a major growth from 22 casks and 130 attendees when it had first began on the quaint patio of Bar Volo in 2005. October 23rd will welcome the 11th Annual Cask-Conditioned Beer Festival at Evergreen Brick Works, where it will be a three-day journey of discovering breweries from Canada, United Kingdom and the United States (California & New York State). About Cask Days: It encourages brewers to experiment, explore diverse styles and have the opportunity to showcase their finest brews, in most cases – one offs that are especially made for the event in cask-conditioned form. Our goal is to host a unique beer festival experience that celebrates local craft beer, food, art and music. What exactly is a Cask? The earliest form of beer: cask-conditioned ale, also known as cask ale or sometimes real ale. Unlike most beer, which is delivered from the brewery in a finished state, cask-conditioned ale does not complete its fermenting until days or even moments before it is delivered to the drinker, with a small amount of fermentation continuing in the cask from which the beer will be poured. Tickets are ranging from $25-$150 and are available for purchase from http://caskdays.com. Beer. Ciders. Duh. All 300 of them. 32 India Pale Ales go head on for the 7th Annual IPA Challenge! Be a (beer-tasting) pioneer! 30 Washington beers at Cask Days that have never been served in Ontario before. Savour the last days of warmth before winter comes!